Honestly, i'm a bit of a skincare addict. I've never had the best skin as it's always been quite acne prone, and after a spot has long left, a scar has taken it's place. So as you can imagine, i'm always on the hunt for products that will prevent spots, even out my skin tone, fade scars, and balance oils. I think i finally have it down to a nice routine that works for me - thank's to the help of Carolin Hiron's blog. But more on all of that later. Today i want to talk (rave) to you guys about my favorite toner EVER. Yes, that's a bold statement to make, but this product has become a cult classic for good reason. 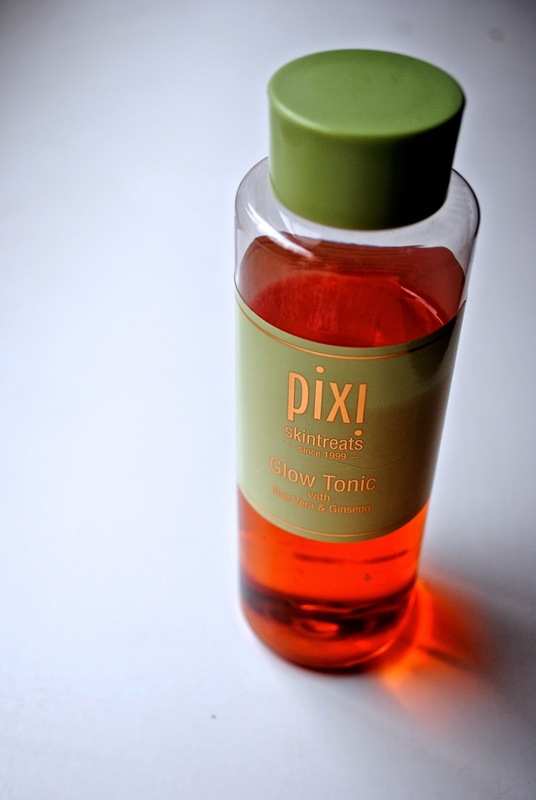 Pixi's one and only Glow Tonic. If you're thinking "meh, what's so special about a toner, they're not so important anyway" girl, are you wrong. Toner's are not there to remove traces of makeup (cleanser's job!) or close pores, but rather to balance out the PH, and help the rest of your products sink into your skin. I am all about acidic toners for a gentle exfoliation, and that's exactly what the Glow Tonic does. Their website says 'for normal to dry, dull, and aging skin' but i'm more on the combination-oily side and this works great for me. The key ingredients such as Aloe Vera, Witch Hazel, and Ginseng are great for all types skin, and the formula really does help even out and brighten everything. An annoying issue i had before this beautiful thing came into my life was those little pimply-bumps (so technical, i know) that you get around the hairline/on the forehead that just never seem to go away. However, after I incorporated this into my routine, both morning and night, it has almost completely made those bumps disappear, along with balancing my oils and making me look radiant rather than greasy. So if you haven't tried this out yet, i'd definitely recommend picking up a bottle ASAP. Available both in store (if you live in London) or online (ships international, i think) the £16 are WELL worth it. I've been using this product for a mere five days and I can already feel the difference. Thank you so much for this!